There's something shocking and amazing happening this month. I'll give you a hint: it's something that, deep down, everyone looks forward to. No, it's not Smash Brothers or Fantasy Life. It's Halloween! And it's actually coming up a lot sooner than you might think. In fact, it's actually only a few Fridays away! I know, it's incredibly tempting to slog away in the countless brawls on your 3DS, but wouldn't this month be better spent on getting into the spirit of the Halloween holiday? Well, I don't know about you, but I'm going to try my hardest to get into the Halloween spirit this month by slogging through some Halloweeny games. And while I'm at it, I might as well try to pick up some of those hidden treats that are scattered throughout them—it'll be like doing my Trick or Treating early. They stop being Easter Eggs in the fall, after all. "No, no, no. I will not give up my favorite decoration. I like Mario just where he is." As luck would have it, this mirrors a famous quote from Jabba the Hutt almost exactly when he is talking about the frozen Han Solo, saying, "I will not give up my favorite decoration. I like Captain Solo where he is." It should be noted that both Han and Mario have roughly the same gestures while they're in their respective prisons, but admittedly Mario is much more animated. 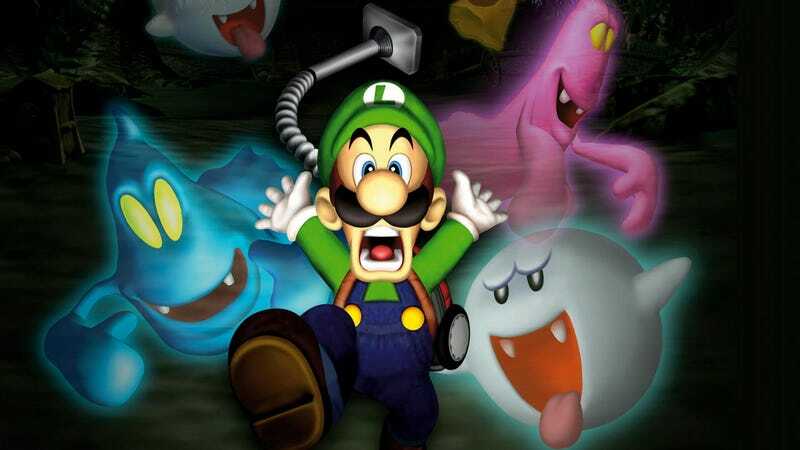 This treat is in the first game in the series, Luigi's Mansion. While the "Get Out of Here" posters aren't exactly a secret, they're something that you can miss if you aren't being thorough enough with your vacuum. Plus, even if you found one, you might not have managed to find them all, as there are actually a few of them scattered throughout the house. There's one in the Washroom on the second floor, one in the twins' room, and finally one in the projection room. The one in the projection room is probably the most well known, and is the one pictured above, since it takes up so much of the screen it doubles as a pretty fantastic jump scare. The opening of Luigi's Mansion: Dark Moon is filled with references to the previous game. There is one scene that slowly zooms in on Luigi, starting from outside of his house and slowly making its way inside. Veterans of the series might notice that the house looks incredibly familiar. In fact, it is actually the mansion awarded to Luigi at the end of the first Luigi's Mansion for getting a D Rank. On top of that, once the camera actually makes its way inside of Luigi's home, a poster can be seen just above his fireplace. This is actually the map he used to find his way to the mansion from the first game. Don't you hate it whenever you actually have to get into the game to find Easter eggs? Well, as luck would have it, the developers were kind enough to leave a few scares left for you before you even start the game. During the file select screen, just under the words, "Which file would you like to load?" there is a message saying "Welcome to your mansion..." If you wait long enough and pay close attention to the words, however, one letter fades a bit faster than the rest, changing the once warm welcome to a slightly creepy remark: "Welcome to our mansion..."
If you were one of the few people who ever bothered to copy a file, you might be aware of this message. Under "Which file would you like to copy?" the game so dutifully reminds you that "More files mean more fear." Finally, when you've given up on the game entirely and go to delete your files, the game asks "Do you really want to erase the files?" Below that, there's text saying "You can erase the files," which slowly transitions to "but not the fear." Just like most of the games he's composed for, Kazumi Totaka managed to slip in his favorite little tune into Luigi's Mansion. If you wait in the controller configuration menu for three and a half minutes, a jazzy tune will begin to play. This will eventually give way to Totaka's song before returning to the same tune. That's all for this week, everyone! Be sure to check out Did You Know Gaming and GameXplain for their videos on Luigi's Mansion, which did a fantastic job at summarizing an internet's worth of research into a handy video. Don't worry if you didn't get your fill of Halloween treats, I'll be back next Friday with more tidbits for you to look through!